The name Bahrain is derived from an Arabic term for “two seas,” and creators of The Ritz-Carlton Spa, Bahrain clearly had those seas in mind when conceiving this water-centric getaway. Every detail, from the treatments to the lobby décor, seems designed to evoke the ocean — and the spa sits just a few steps from the resort’s white-sand beach. 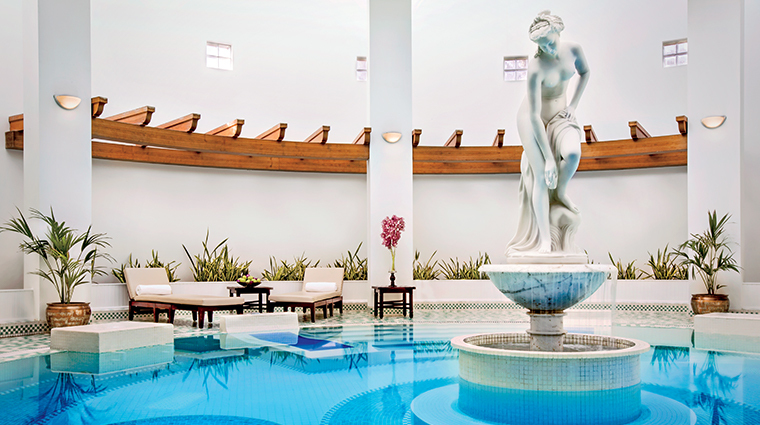 At this haven, water features like a Thalasso pool and a quartet of plunge pools set a relaxing tone. And the extensive list of treatments follows suit. Take the On the Banks of the Dead Sea, a massage that uses the region’s famed mineral-rich mud and water for a one-of-a-kind experience, or the Her Secret Sanctuary, a cleansing ritual that includes a rose steam bath, a lather of olive and lavender soap, an exfoliation, a shampoo and conditioner application, a face and body mask and more. Be sure to set aside some time to relax by the atrium pool. With white-washed walls, plush loungers and sparkling blue waters surrounding a Romanesque statue, the space practically transports you to the Mediterranean. Drawing on Arabian history, the treatments at this sumptuous spa utilize locally inspired ingredients, including Dead Sea mud, black olive and lavender soap, and argan oil. The fitness centers, featuring a coed gym and a ladies-only facility, offer a wide range of group classes, including Bollywood dance, Pilates, TRX, spinning and outdoor bootcamp, as well as free weights, strength and cardio machines — all with a view of the resort’s gardens and beach. An indoor pool, two temperature-controlled outdoor swimming holes, an indoor saltwater therapy option and several plunge pools make The Ritz-Carlton Spa Bahrain a place to make a splash at any time of year. This luxury spa is not just for ladies; male guests have plenty of pampering options designed just for them. 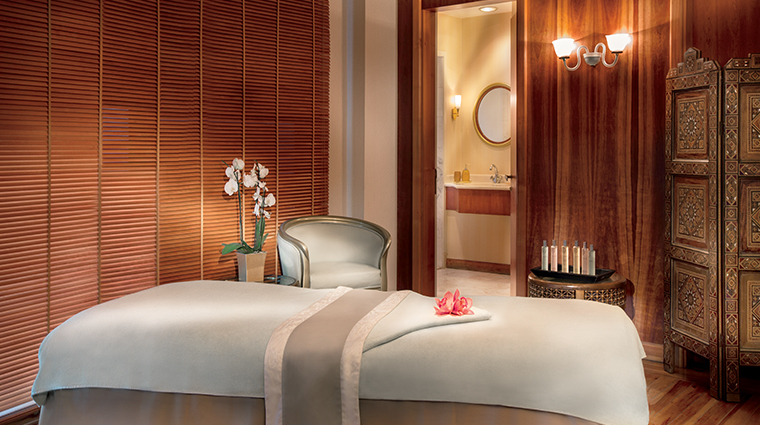 Treatments include a men’s massage, a“power hour” that aims to invigorate and clean the body, and a dedicated facial. The Ritz-Carlton, Bahrain offers Royal Beach Club memberships, which can mean crowded conditions on weekends — particularly in the mixed-use pools and locker rooms. The monthly farmer’s market also brings dozens of people through the spa entrance to reach the outdoor lawn. Ladies are advised to arrive at least 30 minutes before their treatment to enjoy the relaxation room, sauna, steam room and Thalasso pool. Men are required to wear shorts while receiving treatments, and bathing suits are required in all spa facilities. Those looking for an Arabic experience can choose from four treatments inspired by the region, ranging from a FourHands Royalty Massage to On The Banks of the Dead Sea, a service that includes a salt scrub and mud wrap. Virtually every kind of massage is available at the Bahrain spa; choose from Thai, lomi lomi, deep muscle, stress relief, hot stone, herbal poultice or even a prenatal option. Turn back time with one of three anti-aging facials, or treat and balance your skin with a customized option based on your needs. Enhance your treatment with a non-invasive glycolic peel or a hair conditioning mask and massage. The Ritz-Carlton Spa Bahrain has its own entrance from the parking lot, so you can visit the facilities without walking through the hotel lobby. 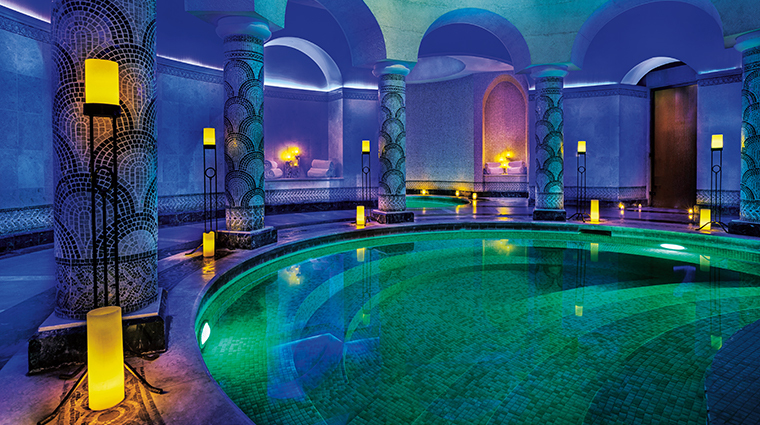 Of course this Middle Eastern spa boasts a traditional Turkish bath, but this is no ordinary hammam. Four separate plunge pools are set at a different temperature for the ultimate aquatic experience. The gorgeous ladies-only Thalassotherapy pool allows women to experience the therapeutic power of seawater privately, if they don’t wish to take a dip in the Arabian Gulf at the resort’s beach.